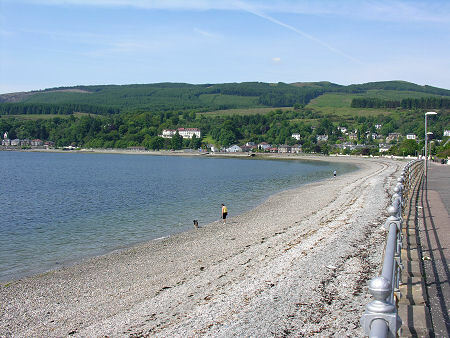 Dunoon lies on the west shore of the Firth of Clyde where it turns south towards the Isle of Bute and Arran after flowing through the Glasgow conurbation. It is located on the east side of the mountainous Cowal peninsula and is more easily accessible by sea than by land. This gives it a very attractive "island" feel. 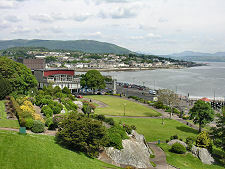 Dunoon is the largest town in Argyll and is built around two bays, East Bay and West Bay (aligned, confusingly, north and south of the centre of the town). Between them is a hilly nose of land sticking out into the estuary. 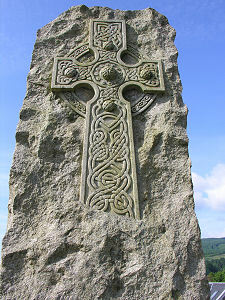 This was the site of Dunoon Castle, once a major stronghold and originally built some time around 1050. It had been abandoned by 1650 and today nothing remains beyond a few grassy lumps on top of the hill that provides such an excellent viewpoint over the town and the Firth of Clyde. 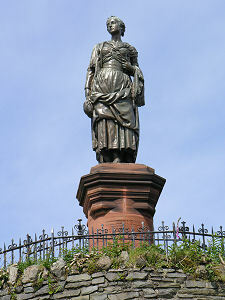 Below the top of the hill and overlooking the Clyde is a statue erected in 1896 of "Highland Mary": Mary Campbell, who was romantically linked to Robert Burns. 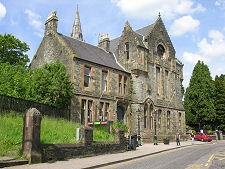 Just to the north of the site of the castle is Castle House. This was built (partly using material removed from the castle ruins) in 1822 by the Lord Provost of Glasgow, James Ewing. Local folklore suggests this was the site of one of Scotland's first battles over the right of access to land, after Ewing fenced off common land to form the garden of the house. The people won, and today Castle House is a museum standing in a public park. But if James Ewing failed to keep the public out, he succeeded in putting Dunoon on the map as a place for wealthy Glaswegians to build their riverside villas; and for slightly less wealthy Glaswegians to spend their holidays. A pier had been built here by 1820 with a ferry across the Clyde, and direct steamer services to Glasgow began in the 1840s. 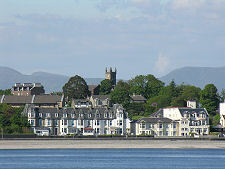 With the linking of Gourock to Glasgow by train in 1889, Dunoon became even more accessible to Clydeside's large population. Dunoon is well served by ferries. In 1973 Western Ferries began operating their distinctive red and white vessels from Hunters Quay, two miles north of Dunoon, to McInroy's Point on the edge of Gourock. 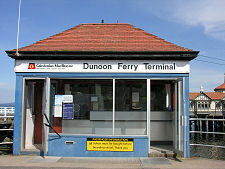 This was in direct competition to CalMac's service, established in 1954, from Dunoon Pier to Gourock. 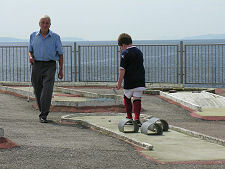 The CalMac service has in more recent times been replaced by a passenger only service opeated by Argyll Ferries. Today's Dunoon has been formed by its history. 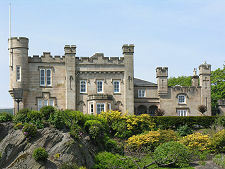 Though the castle is long gone the grand villas that were built in the 1820s and following decades continue to occupy the best spots on the shoreline and the land rising above it, both in Dunoon and along the Clyde to the north towards Hunters Quay. Alongside the development of villas came distinctive hotels and an impressive town centre. 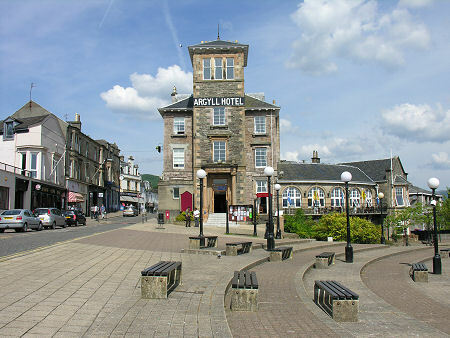 Notable hotels include the prominent Argyll Hotel in the town centre overlooking the pier and the less obvious but superb Abbots Brae Hotel standing high above the West Bay. 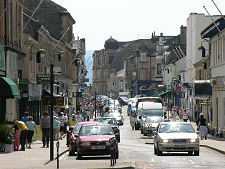 Dunoon found the economic environment of the late 1900s more difficult than that of the 1800s. With the coming of package deals to the Mediterranean, the tendency of Glaswegians to spend their holidays "doon the watter" diminished: and with it the trade for the hotels and guest houses on the Clyde. 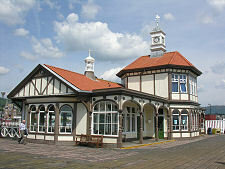 For a while Dunoon was insulated against the decline of the Clyde resorts by the Cold War. A major US Navy submarine base was built in Holy Loch, just to the north of Dunoon, in 1961. 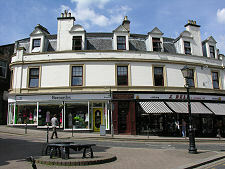 By 1991 a quarter of the population of Dunoon and the surrounding area was American, so the closure of the Holy Loch base in 1992 was a serious blow to the local economy. More recent years have seen the town coming to terms with the economic impact of this by successfully building on its enduring assets of a seaside location and an attractive mountainous hinterland. As a result it has succeeded in bringing in jobs and a new breed of tourists using Dunoon both as a destination in its own right and as an alternative gateway to the western Highlands. Some seven miles north west of Dunoon is one of the Cowal peninsula's major visitor attractions, the superb Benmore Botanic Garden. Also well worth exploring while in the area are the settlements of Toward, south along the coast, and Ardentinny, to the north.